Timothy George, MD, received the 2012 Hawley Seiler Residents Competition Award. 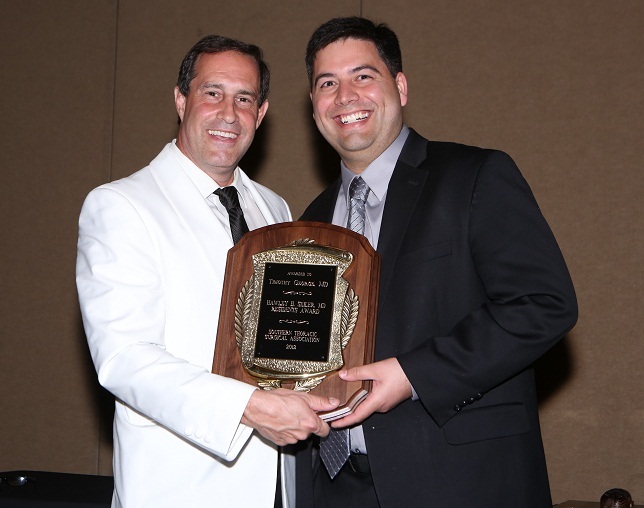 Dr. George is pictured here with Dr. Robert Cerfolio at the STSA 60th Annual Meeting Awards Dinner & Dance. STSA is currently accepting abstracts for its upcoming 62nd Annual Meeting. Residents, don’t miss this chance to submit your work and compete for the 2015 STSA Hawley H. Seiler Residents Award. Named for STSA Past President and Founder, Hawley H. Seiler, MD, this award is presented annually to the resident who most excels in their manuscript and oral presentation at the STSA Annual Meeting. The 2015 Hawley Seiler Residents Award winner will receive $500, a personalized plaque, and their name will be engraved on a permanent plaque to be displayed at future STSA Annual Meetings. The winner will be announced at the Nov. 7 Annual Awards Dinner & Dance. Residents participating in the competition will be eligible for reduced-price tickets to attend this event. To apply for the award, submit an abstract to be considered for presentation at the STSA 62nd Annual Meeting and check the box indicating that you wish to participate in the Hawley H. Seiler Residents Award Competition. The deadline to submit abstracts is April 6, 2015, 11:59 pm, ET. Review the abstract submission guidelines and visit www.stsa.org/abstracts for additional instructions. The STSA Annual Meeting is an exceptional forum for disseminating your work to the entire field of cardiothoracic surgery. STSA Annual Meeting presentations are submitted for publication consideration in The Annals of Thoracic Surgery, which has a circulation of more than 8,000 subscribers. Additionally, the Southern is known for its unique collegial and social spirit; the intimate size of the STSA Annual Meeting provides ample opportunities to network with leading surgeons in the field. Learn more about the award and see a list of past recipients. Contact STSA Executive Director, Megan Drumm, with questions at mdrumm@stsa.org.